Trump Confirms Exit Of White House Counsel McGahn - Joe.My.God. White House counsel Don McGahn, who had extraordinary access to President Donald Trump during some of his most controversial dealings and decisions, will leave his post this fall, the president said Wednesday. Trump announced McGahn’s departure on Twitter hours after a report by Axios broke the news that the lawyer planned to leave. 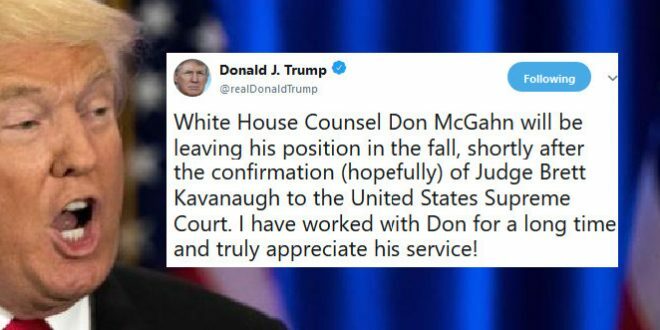 Trump thanked McGahn for his service and confirmed his counsel would leave in the fall after the Senate confirms Brett Kavanaugh to the Supreme Court. Axios reported McGahn wants Emmet Flood to replace him. Flood represented former President Bill Clinton during his impeachment and was hired by the Trump White House to deal with the Russia investigation. Flood also worked for former President George W. Bush.